Built to take a slam, this sand filled ball lets you perform a wide range of ballistic core exercises. The sand allows the ball to absorb the energy of a slam instead of the ball bouncing or rolling away. Other look-alike slammer balls have seams that can split. Ours are a specially formulated resilient soft shell which is rotationally molded for a seamless construction. Other slammer balls have corks that can pop if you slam the ball at the wrong angle. Our no-cork balls have an air valve that's securely molded into the ball making for a slam proof ball built to take thousands of slams. Perfect for slam ball, wood chops, overhead throws, twists. 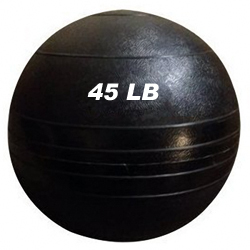 These premium balls are the choice of pro teams, studios, and military installations worldwide.